One of the most popular British series ever issued Out into Space, BB3, has it all. Two print variations, an error card, high catalogue value plus continual incorrect information!! This article is my attempt to correct the incorrect information for once and all and also explain the card number 11 variations. Only the reader can decide if my efforts are successful. There are two printing variations in this series. The first printing, the rare, high catalogue value, generally known as ISSUED WITH and the second printing ISSUED IN. The catalogues and reference books tell us the first printing was issued in 1956 and the second printing in 1958. I believe this information to be wrong and that BOTH variations were issued in 1956. The following information will explain how I arrived at this conclusion. Note how each series has a “life” of about a year, and also that, apart from Wild Flowers, each series has more than one printing. Now if I expand the above list, to show the YEAR/s of issue for each DISTINCT printing, as some reference books do, matters become interesting! Note all series were issued for about a year and therefore each series was issued within a two calendar year period. As can be easily seen from the above list the COMMON “Out into Space” issue does not fit into the year of issue as there is simply no room for it!! Also note that the RARE, HIGH value, variation has a “life” of a year. This does not make any sense at all. But if the previous list is reproduced with the “issued IN” variation in what I believe to be its correct place all seems logical…. Now all seems to make sense. The “issued with” has a short life, and can therefore be considered rare plus the “issued in” has a place where it fits in neatly. To test my theory I have contacted several collectors who remember “Out into Space” being issued in packets of tea. NONE can recall this series being “squeezed in” in 1958. So if I am correct, how did the 1958 incorrect information occur? My best guess is that when the first Brooke Bond reference book was being prepared, in the late 1960’s, the compiler asked Brooke Bond and Berkshire Printing for dates of issue and the information he was sent contained a “typographical error”. What should have been a 6 was typed as an 8!! And the rest, as they say, is history. 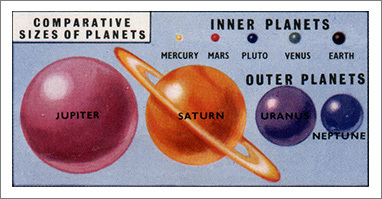 The “issued WITH” printing has number 11 with the “inner planets-outer planets” caption. Although this information is wrong it was NOT corrected in this printing so there is no error card in this printing, only an incorrect card. In the first “issued IN” print run the number 11 also contains the incorrect information BUT was then corrected by removing the “inner planets-outer planets” caption in subsequent print runs. 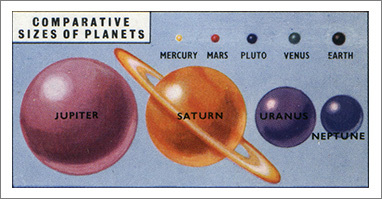 The number 11, issued IN, with the “inner planets-outer planets” caption is the error card, and can be hard to find making it quite valuable. If you do not know, the reason the caption is incorrect is that it lists Pluto as an inner planet when it is, in fact, an outer planet. This information is given in the text of this card!